When he wakes up, it's the morning of his first day of high school, three years ago. As he confusedly goes through his day, he's able to correct a lot of the mistakes he made the first time around, such as actually interacting with the cheering squad girl, Usami Yoshiko! But did he really travel in time, or is this all just a dream he's having while his body is lying unconscious somewhere? Could he really have the chance to go through his high school years again? Take Isamu is an elitist 6th grader who looks down at his peers because he is the best at everything he does at school, from looks and smarts, to his luck with girls and his abilities as an athlete. He considers himself to be in the top percent of his age group and is incredibly bored with interacting with the so called normal people. 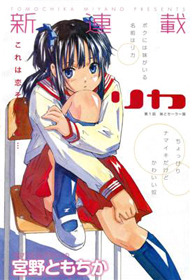 A new student, Kaname Moka, transfers into his school and as she is fairly pretty, Isamu asks her out. Moka mishears what he says and thinks he wants to challenge her, as she grew up boxing. In fact, Moka is an amazing fighter and can even take down 5 middle school boys at once. Although Isamu can’t stand her violent personality and she can’t stand him for having so much pride, they start to grow attracted to each other. But then Isamu finds out that not only is Moka more athletic than him from all her years of boxing, she's also much smarter than him. Will he able to get over his overly sensitive pride and dive into a romantic relationship? 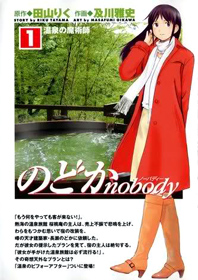 Momoko is a shy girl who spends all her time reading girly novels. She longs to fall in love like the heroines in the stories she reads, and one day her dream seems to come true! 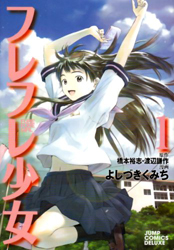 After a fateful encounter worthy of a novel, Momoko decides she's in love with Oshima, her school's ace baseball player. But how can she get closer to him? After consulting her precious books, she eventually ends up helping to revive the unpopular traditional Japanese cheering club to cheer at the school's baseball games. However, they've only got just enough members to keep it from being abolished, and none of them seem to know exactly what they're doing. Their first performance is so dreadful that people even blame them for the baseball team's defeat! Their ragtag cheer squad will have to get its act together if Momoko is to have any chance of realizing her fiction-worthy romance! 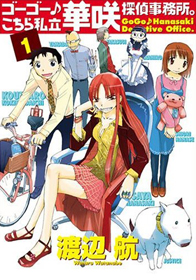 Go-Go Kochira Shiritsu Hanasaki Tantei Jimusho. Kokindaichi Kotaro just recently got accepted to work at the Hanasaki Detective Agency and can’t wait to get real work experience as a Private Investigator. Headed by a young beautiful woman named Hanasaki, her crew of detectives is nothing you would expect. They spend a majority of their times doing nothing and fooling around with no real case to work on. Kotaro tries to learn as much as he can, but the unprofessional work atmosphere makes it really hard. Just when he's about to give up, he sees what amazing potential each member of the agency has. Nishimoto Haruki is a 21 year old male and a newly recruited police officer. 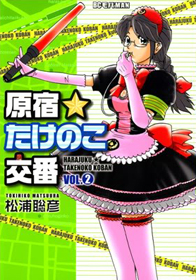 However, all his past assignments involved him dressing up as a girl in order to solve the crime. It seems that he has the feminine features that make him the only one suitable for the position. However, things get even crazier when he is assigned to be in the all female police squad surrounded by gorgeous women. He has to protect his secret that he’s actually a man but Haruki is already having a hard time controlling his urges. Ichikawa Etsuko used to be a regular high school girl and lived a poor but normal life, but her no good dad accumulated so many loans that he sold her in order to get rid of his debt. 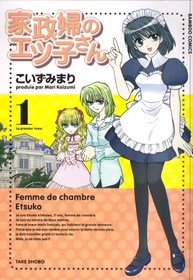 Typically, this story wouldn’t end well with the girl being sold into prostitution, but, luckily for Etsuko, she's forced to become a maid to a rich family. Her job is to attend to the every need of the Kurofuji siblings, the brother Arei and the little sister Erika who are French and Japanese. Etsuko seems to never get anything right, but she better or the alternative won't be pretty. Nagase Nodoka is a young female architect who has a reputation for designing amazing onsen (bathhouses). She and her assistant, a cheerful, energetic girl nicknamed Mike, travel around Japan together. While they enjoy the natural hot springs and get to know the people at each locale, Nodoka designs beautiful baths to fit each of their clients' needs. Sugano Ikkei is a typical teenager at his high school and lives with his older brother Hyakkei who is an editor at a publishing company. Hyakkei is in charge of several artists and writers and his job is to support them in anyway possible. However, he broke his leg and is unable to leave the hospital for a week and he has a very important meeting with a very shy writer named Tokito Aona which has taken months to get a face to face meeting. As they look really alike, he asks Ikkei to dress up as him and go as Hyakkei. 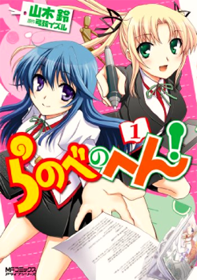 The meeting goes well without her knowing the truth, but Ikkei is forced to go to another meeting with Fujimaki Misuzu, an artist moving to Tokyo in order to continue working. To his surprise, both girls, Tokito and Fujimaki, are in the same class as he. Now he has to juggle being Hyakkei as an editor to the two girls as well as be their classmates as Ikkei, and do all this without letting out the secret that he is the same person. This is the story of a small cafe called Saudade, the Portuguese word for nostalgia. Tatsue, Yoshino, and Ryou, the employees, interact with their various customers. Hachiken left his home in Sapporo in order to go to an agricultural high school out in the Hokkaido countryside. His plan involved leaving home to live in a dorm, acing the simple courses, and easily surpassing all of his inferior classmates. However, his new school turns out to be not quite like he expected. All of the other students have distinct areas of expertise and chosen future careers as veterinarians, dairy farmers, and so on. They don't understand why Hachiken would even come to their school without a similar dream. Also, the un-athletic Hachiken is horrified to discover that clubs are mandatory, and they're all activity-based. He had thought that he would leave his agricultural classmates in the dust, but will he even be able to keep up? The one that stuck out this week was 'Again'. It was actually a very interesting, well-written story. I hope he has a real second chance, and it is not just a dream. 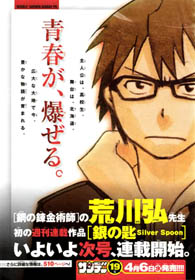 Silver Spoon also seemed like it could be interesting. It looked like it was going to be about how people who hold a non-academic specializations are not necessarily dumb at all. All the series this week were good. All comedy and romantic comedy series. 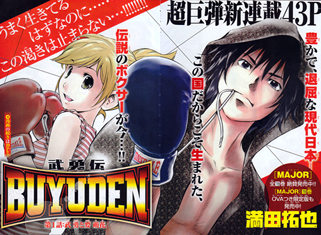 Buyuden - all I need to say is everyone needs to read at least the first few chapters. Go Go Kochira...Jimusho - comedy about a very odd and lazy detective agency. Super funny. 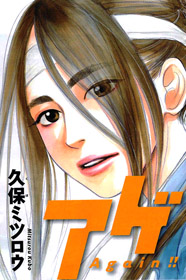 If you haven't done so already, check out the scanlations of the mangas from previous shout outs which have been recently scanlated: historical drama Agrippa (MH link). Can you bring back the "latest" tab? Shoujo and manwha replaced it. 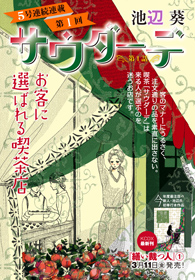 @ kanamechidori: It's under "Database"
4th chapter of Buyuden came out last Friday, so it's 4 chapters (ongoing), not 3. Again!! look great. Who never thought of what his school years would have been if he had the chance to go back then ?